Want a virtual reality headset, but the high price of most existing products exceeds your budget? Don’t worry. Cardboard lets iOS and Android users transform their phones into VR headsets with the help of a DIY cardboard viewer. And then you’ll hold it up to your face and enjoy 3D videos from your smartphone. There is no doubt that the most popular Cardboard viewer among 3D lovers is the Google Cardboard 2, which is an excellent VR headset with lower price and powerful compatibility with nearly any smartphones including Android and iPhone. If you happen to use iPhone and have a bunch of DVD collections , it is an awesome way to watch DVD movies from your iPhone through Cardboard viewer with 3D effects while laying on your bed. In this page, we will introduce a simple way to enable you watch 3D movies on Cardboard viewer from iPhone without any limit. How to watch DVD movies on Cardboard Viewer from iPhone with 3D effect? To watch your own DVD movies on Cardboard viewer with 3D effect, you can firstly download a free app called Cardboard theater from Google Play, which allows you to enjoy your own 2D and 3D movies in a virtual cinema. And then just upload the movies on the iPhone or open them directly from a browser or a 3rd party application and load the movies with this app for enjoying. However, Cardboard lacks ability to play DVD movies but it can play Side-by-Side MP4/MOV videos. So in order to watch DVD movies with 3D effect on Cardboard from iPhone, you need to rip and convert DVDs to SBS MP4/MOV 3D videos. That’s why we need to look for the best DVD to 3D video converter secondly. To watch any incompatible file formats such as 2D/3D DVD video files on Cardboard viewer in 3D effect,you need a DVD to 3D video converting tool. You can use Pavtube Video Converter Ultimate (Mac version), which can easily remove copy protection and region code from DVD discs without the help of any other software and then create 3D side by side MP4/MOV fromats keeping the best quality for watching on Cardboard viewer via iPhone. What’s more, it is a comprehensive tool that’s capable of converting various media files to 3 different 3D formats( Side by Side 3D, Anaglyph 3D and Top-Bottom 3D) to watch on other Virtual Reality devices including Samsung Gear VR, Oculus Rift, HTC Vive, Zeiss VR One, etc. With this DVD to 3D video converter, you can not only convert DVD, but also 2D/3D Blu-ray to Cardboard supported side by side video files. So if you need to watch Blu-ray movies on Cardboard viewer from iPhone with 3D effect, the next guide is also suitable for you. Converting DVD for viewing in Cardboard is as simple as ABC. After download and intall the DVD to 3D video converter, follow the steps below to convert DVD to Cardboard playbale 3D formats. Insert the DVD disc to DVD-ROM and click ‘File" button to have movies uploaded to the DVD to 3D video converter. You can also import ISO files, IFO files or DVD folder for conversion. Blu-ray and other videos are also allowed. After the movie files are imported, you can preview them by double clicking the titles and take snapshots of your favorite movie scene if you want. Tap on "Format" bar and find "3D Video", there are a lot of format options for you. 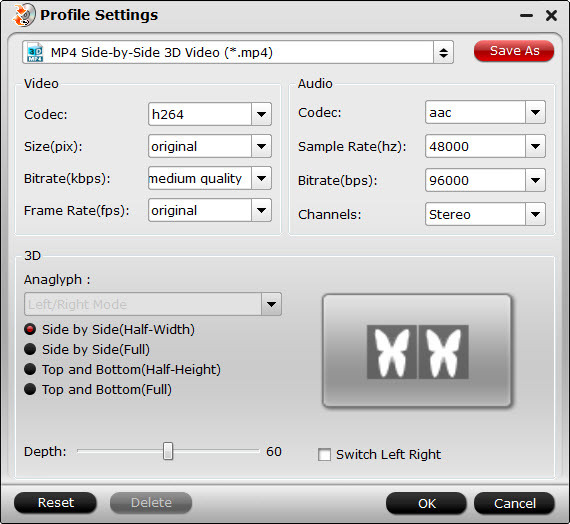 You can choose the output 3D format according to your phone, here "MP4 Side-by-Side 3D Video (*.mp4)" or "MOV Side-by-Side 3D Video (*.mov)" is recommended. You are able to get immediate preview of 3D effect on preview window. Then click the "Browse" to choose the folder where you want to save your 3D movies in. Click "Settings" to open "Profile Settings" window, here you can adjust 3D video depth to get better 3D visual effect or check "Switch Left Right" option to reverse the image displaying order for you. Tip: If you want to get better DVD entertainment on Cardboard viewer, you can click "Edit" button on main UI to customize your videos for Cardboard viewer. You can crop the frame size, trim your favorite part form the DVD movie, add watermarks and subtitles, append artistic effects and more. Click the “Convert” on main UI to realize DVD conversion to Cardboard playable 3D formats. Ticking off Shut down computer after conversion option, you can leave the program running and do other things instead of waiting around for the conversion. 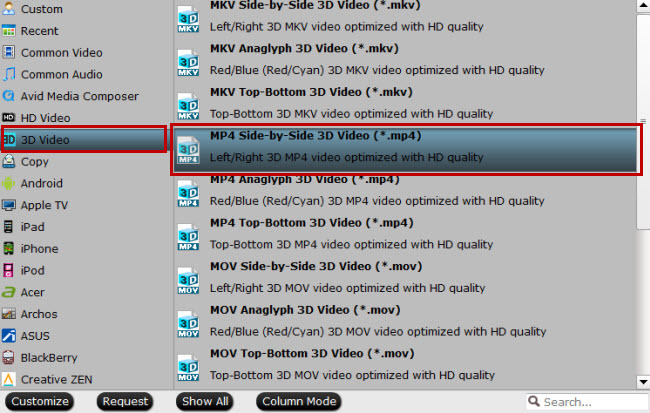 After the conversion, click Open output folder to get the created 3D movie. Then, you can transfer the generated 3D video files to your iPhone and other devices for watching on Cardboard Viewer with the Cardboard theater app. With the generated 3D movies, you can also enjoy 3D movies from your iPhone on VR Box 2.0, Google Daydream VR, PS VR, Homido VR, etc. How to Watch 3D SBS Video on VR Box 2.0? How to Watch 2D/3D Videos on HTC Vive?